Scissor lifts are a type of aerial lift designed to allow people to work safely above ground. They can handle most types of work that normally require a ladder, tower or scaffolding. They also enable operators to complete jobs faster and safer without the setup time required of ladders and other equipment. -Productivity. Workers complete jobs quicker because they can focus on the job rather than worrying about unstable supports. -Flexibility. Scissor lifts can be used indoors and outdoors in many different environments and under varying work conditions. -Compact Design. Scissor lifts don’t take up much space when retracted. This makes them easy to move around in cramped warehouses and storage sites. -Ease of Transfer. Scissor lifts don’t have to be dismantled to move from one job site to another. They can be towed easily and safely when retracted. -Construction. Scissor lifts provide flexible solutions for construction projects of all types and sizes. They can be used for installing windows, delivering tools and equipment to upper stories of tall buildings and much more. Their durable design makes them ideal for building renovation and general contracting. -Delivery. Okay, scissor lifts aren’t actually used to deliver things. But they play a key role for delivery companies by fetching products from the shelves and getting them to the loading dock in a timely manner. -Overhead signs. You’ll often see highway workers using scissor lifts to install or replace freeway signs. They are also used when hanging commercial signs on buildings and other free-standing objects. -Railroads. What? Scissor lifts in railroad yards? You bet! Railyard jobs such as loading and fitting into narrow spaces to reach up high require the use of scissor lifts every day. -Retail. From the big-name stores to smaller operations, retailers use scissor lifts to move products around store and warehouse shelves. In warehouses, they are often used to change high overhead lights, repair ceilings and more. -Transportation. Trucking distribution centers would struggle to operate without scissor lifts. Few tools are better at safely reaching and moving pallets, roll cages and parts stored at high levels when loading and unloading large trucks. -Underside inspections. When repairing small vehicles, pieces of machinery or other devices, it’s often necessary to gain underside access. Special types of scissor lifts, called automotive lifts, are specifically designed to lift cars, trucks and other vehicles. -Animal rescue. Do they really use scissor lifts to get cats down out of trees? It happens more often than you might think – and it’s safer than using a ladder. Also, scissor lifts can reach higher and access parts of trees ladders can’t get to. -Sports venue setup. In sports arenas, scissor lifts provide safe, sturdy access when making repairs to overhead lighting and scoreboards. Game officials often use them to measure the 10-ft. height of basketball hoops. -Observation. When monitoring large crowds, police and security firms often use scissor lifts to get a “birds-eye” view of the situation. -Thrills and chills. Scissor lifts are even used for roller-coaster maintenance and repairs. Some repairs are performed on walkways built into the rides. Scissor lifts provide safe access to the-hard-to-reach areas that can’t be accessed from the walkways. 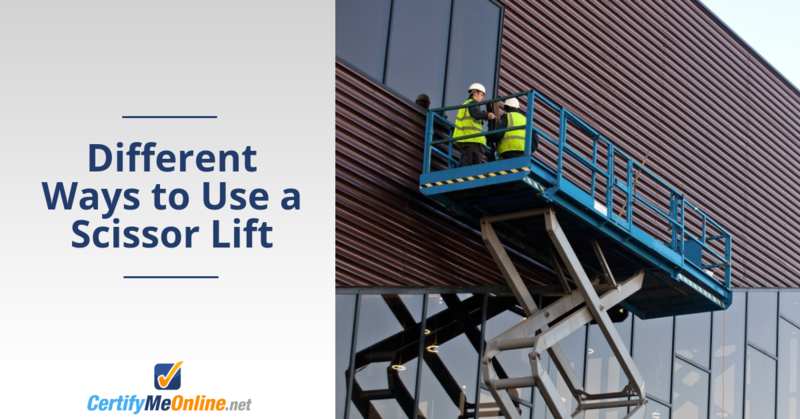 When using a tool like a scissor lift, safety starts with giving operators the right training and certifications. As the online leader in scissor lift and aerial lift training, CertifyMeOnline offers fast, affordable training for scissor lift operators. Completing the online training assures instant certification. Cards can be instantly printed. And you get the peace of mind that comes from knowing your staff is properly trained. Check out all we offer on the CertifyMeOnline contact page. Or call our aerial and scissor lift safety specialists directly at (602) 277-0615. This entry was posted in Scissor Lift Training on August 13, 2015 by admin.